PLANET in PERIL, your "one-stop shop" for the truth about our planetary crisis. : New research confirms the common house fly spreads serious hog diseases. Is Manitoba's factory hog industry dragging its heels? New research confirms the common house fly spreads serious hog diseases. Is Manitoba's factory hog industry dragging its heels? A veterinarian at the Walcott Veterinary Clinic in Iowa, Grant Allison, captured flies at swine operations which had tested positive for both diseases in Iowa and Minnesota. In his words, "Flies replicate in moist conditions that could involve manure. So there's an intimate relationship between manure and viruses and flies. The idea that flies might be a possible vector was immediately obvious. We came up with a plan and started by finding an outbreak and trapping flies to see if the flies were positive." Not only were they carrying live viruses for both diseases, they were spreading them to healthy pigs and making them sick. What's more, the flies were even found to be infectious in January, usually considered the off-season for such harmful vectors. Dr. Allison recommends putting a larvicide in the hog feed as one tool in a program to achieve effective fly-control. He believes an extensive program of spraying or fogging would pose too many dangers to the health and safety of workers. What he does not mention is using anaerobic digesters (ADs) as a possible means of tackling this very problem. These complex pollution control devices use microbes in the absence of oxygen to break down pathogens in slurry, the liquid waste of hogs. The U.S. Environmental Protection Agency confirms that, not only do ADs drastically reduce offensive slurry odour (making slurry less of an attractant), they "lower pesticide expenses because of reduced fly hatching." Trouble is, at the behest of the hog industry that ADs are too expensive, the Manitoba Government last year removed a requirement that they be built along with any new barns. As a result, there is said to be not a single AD in operation anywhere in the province. And it's not believed there are any plans for any in the future, either. 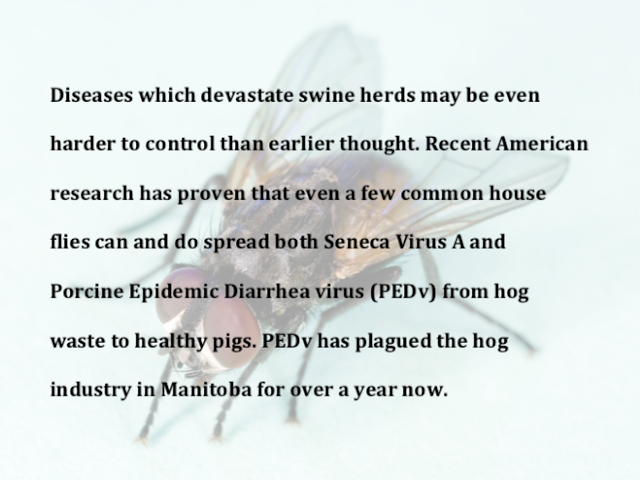 Meanwhile, PEDv has ravaged Manitoba's hog population since a serious outbreak began over a year ago. While mortalities, especially among piglets, were obviously high, the industry won't give numbers. And the province says it doesn't know, because it doesn't keep track. The U.S. study was published in "Farm Journal's Pork" earlier this year. Please also read: "In Hogs We Trust, Part 111"
I do believe the factory hog industry in this province has become its own worst enemy. for the industry here, won’t say. And the government doesn’t know, because it doesn’t even keep track! Other losses? Common sense would say they must be high, as well, in both dollar (economic) terms and the sheer, immoral and unnecessary waste of both live, sentient beings and what the industry would call, its "product," pork. in the stench, the incidence of fly-hatchings, too! But, since our current, “corporate-friendly” provincial government no longer requires such digesters, the industry is, of course, not installing them. (So much for “good corporate citizens” voluntarily “doing the right thing.”) Has anyone heard of any owners who’ll be installing them along with the scores of new barns now going up, as we speak? Because I haven’t! A veteran “hog watcher” I know in this province can recall, back in the days of the Filmon government, when concerns about the role of flies in spreading diseases were raised, they were dismissed by both government and industry, as “fear-mongering.” Reminds me of the fairy-tale about the boy who cried wolf. Except, this time, there is a wolf and no one gives a damn. And, as long as we keep electing governments who invariably choose narrow economic interests over science and the health of their own people, nothing will change. Larry Powell lives in Shoal Lake, where he publishes www.PlanetInPeril.ca.